Recently our Library held a pilot Victorian Indigenous Research Workshop over two days. This included Library orientation sessions, and research discussions. One attendee, Bill Hunter, was researching his grandfather, Fred Hunter, a star footballer in the Healesville area for many years from the early 1900s. On a day when Hunter “got another of his fancy screw goals” against Wandin, former Melbourne coach Alex ‘Joker’ Hall, retired Carlton dual premiership player Jim Marchbank, and Leon Phillips (Footscray) were in attendance. Bill believes they were there to watch Fred and to learn the secrets of his kicking prowess. Fred Hunter turned out for Healesville Football Club for many years, winning best player awards and playing in their 1920 premiership team. Fred also played games for the aboriginal Badger Creek team. His father Richard Rowan was a notable sportsman, excelling at football and cricket, and even riding race horses. He played football for Coranderrk and was a member of combined Yarra Valley sides that took on VFA heavyweights such as Port Melbourne and Richmond. In fact in the early 1890s he was invited to try out for South Melbourne, a leading team in the VFA and one of the foundation teams when the VFL was established in 1897. In an ugly example of institutional racism, Rowan was denied the opportunity to play for South Melbourne by the Aboriginal Protection Board. The workshops were a great way for our Library to connect with indigenous Victorians from around the state. Research topics ranged from Aboriginal tribes of the Gunai and Taungurung; the cultural underlay for the Aboriginal Nation; Aboriginal women’s organisations; family history and footballing connections around the Coranderrk / Healesville area. It may be impossible to definitively identify who first developed the screw/ banana kick, but Fred Hunter “the screw kick punter” certainly has a claim to having perfected the kick that originated amongst footballers at Coranderrk. ‘Queen’s Birthday sports’, Healesville Guardian , 25 May,1894, p.2. Article lists Richard Rowan placing in a boomerang throwing competition and Bill thinks Richard’s expertise with a boomerang inspired him to experiment with kicks that changed direction in midair, like a boomerang. In fact the banana kick was often referred to as a boomerang kick in the past. Chips. Healesville and Yarra Glen Guardian, 28 June 1919 p. 1. 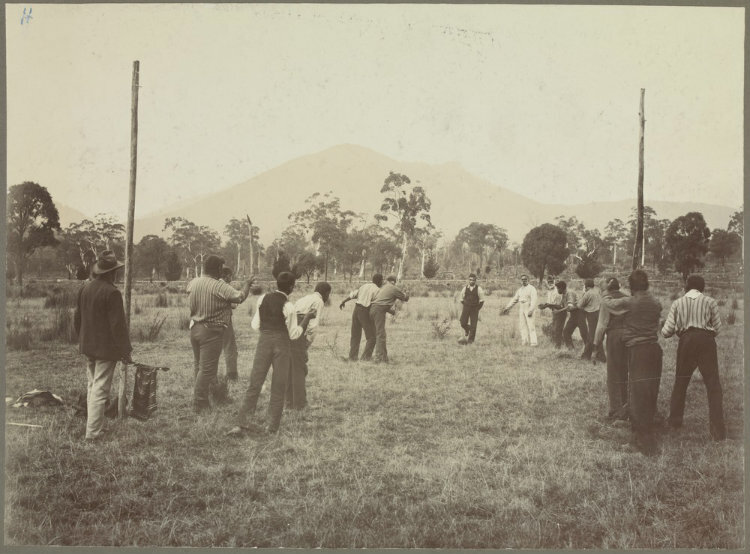 Richmond v. Lilydale Sportsman, 16 August 1892: 6. Lilydale v. Port Melbourne Healesville Guardian, 10 August 1894: 3 . The Lilydale side was augmented by a number of players from the Healesville, Yarra Glen and Coranderrk teams, including Richard Rowan. Aborigines Protection Board. The Argus, 4 May 1893, p. 9.